The third series in a franchise that includes the global hit series The Walking Dead and Fear the Walking Dead will feature two young female protagonists and focus on the first generation to come-of-age in the apocalypse as we know it. Some will become heroes. Some will become villains. In the end, all of them will be changed forever, grown-up and cemented in their identities, both good and bad. The new series is co-created by TWD writer and executive producer Matt Negrete who will also be the showrunner. Co-creator and TWD veteran Scott Gimple will also executive produce, and the network is targeting a 2020 bow for the show. Whether that means that this show will take the place of Fear the Walking Dead remains to be seen. The first TWD sequel is heading into its fifth season, but has seen its ratings decline to marginal levels this past season. Preacher’s End: AMC’s Preacher will be ending with its upcoming fourth season according to executive producer Seth Rogen who put a post on Instagram announcing the news. The announcement does not come as a huge surprise as the ratings were down for that one by 40% last year and it took extended negotiations to get the fourth season renewal. In addition, Rogen’s and Evan Goldberg’s production company Point Grey Pictures has moved over to Lionsgate which may have impacted the status of the show which AMC pays to license. Preacher is based on the Garth Ennis and Steve Dillon comic of the same name about a preacher who tries to track down God after Almighty has abandoned heaven. The final season should debut later this year. It was definitely meant to grow the world that we had already built and to see the next generation of what Oliver and Felicity and our present-day team have worked so hard for, and sort of see what happens in the future. We love those characters and would love to see them go on in some capacity after the show’s over… We were so happy, internally, about how it came out. We kinda love our future story. 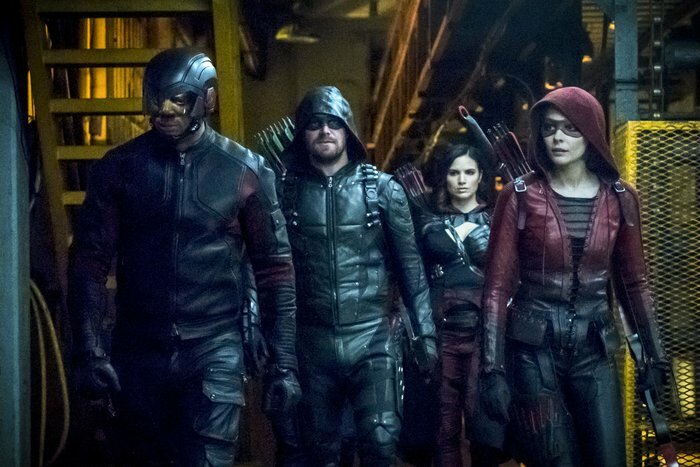 There is no indication that anything is currently in development in the way of a spin-off, but the network has indicated that they want to continue and expand the Arrow-verse, so something could happen down the road. The TARDIS Lands at Pluto TV: Viacom has recently purchased the ad-supported streaming service Pluto TV and is in the process of expanding the selections from that streamer. That will include adding over 200 classic Doctor Who episodes. The service will have a “selection” of episodes from the seasons that starred Tom Baker, John Pertwee, Peter Davison, and William Hartnell and will set up a channel dedicated to the show. This is part of a deal bringing BBC content over to the streaming service and the genre entries Bedlam and Primeval will be included as well. These will be made available for streaming starting in May of this year.